The Electro Detectors EDA-Q670 is a spare / replacement battery assembly for the combined detectors and sounders in the Electro Detectors Wireless Fire Alarm System range. 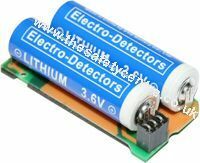 This assembly features 2 lithium battery cells and is designed specifically for use in Electro Detectors wireless fire alarm system devices. This battery assembly is for use in the Combined Detectors with Integral Sounders. Each device takes 2 sets of battery assemblies with one powering the detection side of the device and one powering the sounder side of the device. In addition to the EDA-Q670 battery pack we can also supply the full compliment of replacement Electro Detectors battery packs for all the devices they have produced both currently and in the past. If you’re interested in the Electro Detectors EDA-Q670 Battery Assembly you may also be interested in our Yuasa Batteries and Zerio Plus Wireless Fire Alarm System range.